Hawaiian Monk Seals are a highly endangered species. There are only 1100 left in the world. Today, they are only found in Hawaii. They distinguish themselves from other seals with their plump upper lips. I call them ‘Homer Simpson Lips’. They are only 1 of 2 mammals that are indigenous to Hawaii. They spend two thirds of their day in the water which gives them a green or red algae tinge in areas hard for them to scratch. In daylight hours they spend much of their time on the beaches of Hawaii which are becoming harder for the seals to find privacy due to human influx. Tiger sharks are their biggest fear so feeding at night is preferable. The larger populations of Monk Seals are in Kauai as the tiger sharks lurk off Maui and Oahu more often. The big island of Hawaii has no monk seals probably because there are very little sand beaches on the Big Isle. They will dive 1000 feet for food to escape the tiger sharks that hunt the shallow reefs during the day. The Mediterranean Monk Seal is also endangered and the Caribbean Monk Seal is already extinct. I was lucky to run into this 1 year male on the beach. Every Hawaiian Monk Seal is tagged and marked and kept track of in an attempt to preserve the species. Baby monk seals are called ‘Pups’. Monk seals have a 9 month gestation period just like humans. They are born every year in May. Mothers do not ever leave the pup alone until nursing is complete, about 6 weeks. Mothers do not eat during the entire 6 week nursing period. Whalers almost completely wiped out the Hawaiian Monk Seal in the 1800’s. As usual, man’s greed prevailed against nature when they killed anything that moved. 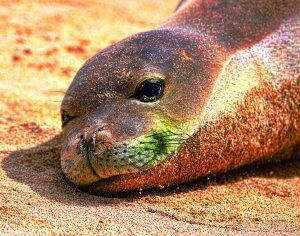 It was thought that every Hawaiian Monk Seal on earth had perished, but some survived and fled to the Northern Hawaiian Islands where man did not visit and today the barely 1000 that remain struggle to survive. I feel very fortunate to have come across this precious boy while out snorkeling on a Kauai beach this past January.